Select ... 5" Back Holder Semi-Rigid (+ $11.95) 5" Back Holder Rigid (+ $11.95) 5" Back Holder Aluminum (+ $12.95) No, thanks! 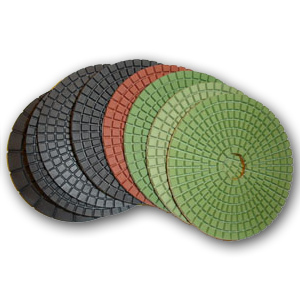 5" JX Shine diamond polishing pads are designed for wet polishing of granite and concrete with more efficiency on larger area such as surfaces. They come with 30 grit, 50 grit, 100, 200, 400, 800, 1500, 3000 grits and white or black buff pad. Choose between white or black buff pad for polishing light colored or darker colored stones.